Let’s be honest, weight training can be a bit intimidating at first. The insane amount of false information doesn’t make it any easier to understand either. When it comes to weightlifting there are countless myths, especially for women. Because of this, many women end up in a vicious cycle of a never-ending cardio routine and a fear of lifting heavy weights. You’ve probably heard some of the following myths at least once, if not many times. However, I am here to tell you that they are just that- myths. In fact, most of these myths all boil down to misinformation or a lack of understanding. So what are the most common weightlifting myths for women? This weightlifting myth is probably one of the most common, and it doesn’t seem to be going away anytime soon. Lifting weights builds muscle and will subsequently burn fat. 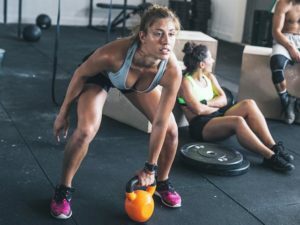 Numerous studies have shown that women who perform resistance training were better able to build strength, improve their body composition and bolster their metabolism. Most women do not fully understand the amount of training required to put on a lot of muscle. It takes a lot, and I mean a lot, to build and maintain muscle. Having said that, women have much lower testosterone levels (the growth hormone needed to build muscle) when compared to men, so the risk of being “muscly” is far lower. On to another common strength training myth. Honestly, this myth couldn’t be further from the truth. While cardio certainly has its place in keeping you fit and healthy, it’s not the only outlet. If you are looking to run at a competitive level, several studies have shown that resistance training can aid aerobic output and performance. Training for endurance doesn’t help build strength or help you achieve an aesthetically proportional physique. In fact, performing cardio day in and day out may actually be moving you further away from your goal. So don’t completely rule out strength training, it can help you achieve your goal a lot more efficiently! Obviously when you are first starting out, you should start with a light load. This helps you to perfect your form and get a better understanding of how to manage resistance. However, gradual progression is key when it comes to strength training. This is no different for women because it’s easy to stagnate on your progress without challenging yourself. It is all too common to hear about women who are afraid of lifting heavy weights and instead focus on “toning” their body using light weights. Heads up — there is no such thing as toning. “Toning”, as it is commonly referred to, is largely a matter of building muscle tissue and shedding unwanted bodyfat to reveal that newfound muscle. In order to increase strength, stamina, endurance and muscle mass, you’ll eventually need to drop those light weights and move on to the next set of weights to truly reap the rewards of your effort. This will also affect your daily life by increasing your body confidence, reducing stress and helping you feel more vibrant overall. So don’t get hung up on the light weights. Keep progressing! This is another myth that is pretty far from the truth. In fact, exercise in older women is crucial and can improve the quality of life. It goes without saying that the older you get, the more at risk you are to bone and muscle deterioration, reduced flexibility and a slower metabolism. Frequent exercise, especially weightlifting, can help slow down the aging process and keep your body in top shape. By incorporating a strength-training program as part of your lifestyle, not only are you able to build muscle effectively, but you’re also better able to increase the strength of your joints and tendons. Overall, lifting weights can help improve the quality of your day-to-day life and can reduce the likelihood of preventable injuries and falls in old age. So don’t listen to this myth, weightlifting is for all ages. In short there is an insane amount of myths surrounding weightlifting. However, they are just that-myths. Hopefully this has helped you understand strength training a bit more, and put some of that initial fear at rest.